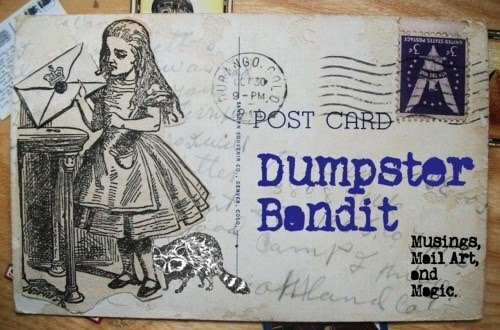 Dumpster Bandit: Like Water, Time runs through my fingers. The Verdant lushness of Spring is incredible. I run my hands through the soft grass, reveling at the touch of it and the stark contrast of my pale hand against that magnificent green- the color of new life. Is there anything more dear than Fallen Leaves that look like Hearts?!? I just had to buy this, to honor someone's adorable little craft here. The whole little scene is within an Emu egg. According to the sticker on the bottom, the crafter also owned an Emu/Ostrich farm. What a crafty use of upcycling an egg! A dear, hand-sized vintage skunk stuffed toy. First up, some Really Neat Owl Socks sent from my Canadian penfriend Beth L. of SendSomething. Needless to say, I was beyond stoked to receive this unexpected & adorable gift in the mail. And my feet have never been more stoked to be clothed in such Awesomeness! Some Properly Awesome Mail Art received from Tardactyl in Las Vegas. One has gotta admire that awesome 70's style. I tell you, they just do not make fashionable clothes as they once did. This treasure of a Polaroid was sent from HappySangria of Swapbot for a "Polaroid Swap". Superb Bicyclist-themed Mail Art received from Moonswings of Swap-bot. Great Random package of adorable vintage stationery from my rad Penfriend DangerousMustache. Funny Postcard of a Vintage Cheerleading photo. I dig the braces, don't you? Letter & a couple neat postcards from Eileen Oh. Digital collage Mail Art received from Fast Eyes. A bit darker and visually deeper than my normal work perhaps. Mail Art Postcard sent out to Missive Maven of SendSomething. This was meant to be a drawing of a Ringtailed Cat (I am obsessed/in Love with them) but when I finished it- well, it looks more like a red panda or a coati or something of the like- apparently my drawing hand has different ideas than my head. Front/Back of a Mail Art Envelope. Sent to fellow Mail Artist Bill Porter of the Olathe Poste. Well, I think that pretty well covers it for the time being. Have you found a story through all these photos? I hope so.